Families come in all shapes, sizes and styles; so do the people who search for them. We may share a common love for genealogy, but we don't always share the same methodology in its pursuit. Most ancestors hunters fall into one of two categories; searcher or researcher. So ask yourself, are you a searcher or a researcher? Do you know the difference? Up until quite recently, I would not have been able to answer that question. 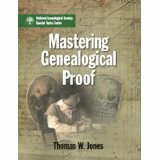 I am currently finishing up an Internet genealogy course based on the Thomas W. Jones book, Mastering Genealogical Proof. This course, which I highly recommend, in fact I cannot recommend it enough, has been a real eye opener. I have always been serious about my genealogy, but this class has helped me evaluate/reevaluate not only my research process, but that of others. This process, the Genealogical Proof Standard (GPS) is critical for genealogy researchers. In fact, no reputable genealogist would consider conducting research without it. So what does it mean to be a searcher? I think there are several types of searchers. First, there is the serious searcher. A serious searcher is looking for their ancestors, but not in the most productive manner. They kinda jump around from books to web to other documents. They never properly cite sources or more importantly take the time to closely evaluate the source. Is it original, derivative, authored, is the evidence primary, secondary, unknown and is the evidence direct, indirect or negative? The serious searcher reaches a conclusion, which may be correct, but they cannot adequately communicate to others how they got there. This was me. (and it will be a long slog turning from searcher to researcher). Then, there is the "I want this to be easy" Searcher. They just go on ancestry.com and copy someone else's tree, and voila, done. Who knew genealogy was so easy, it only took me a week to complete my tree and here's the exciting bit, I'm related to Sitting Bull, Henry VIII and Charlemagne. Next week I'm going to learn Mandarin Chinese. A third type of Searcher is the one who already knows the answer. They flit from website to website looking for someone else's 'research' that fits the answer they want. Did Great Grandma tell you that you were related to someone on the Mayflower? Searchers jump from ancestry tree to ancestry tree looking for one that "proves" Grandma right. Did Grandpa tell you that your Great Grandma was a Shawnee princess, search until you land on website that tells you, heck yeah, Grandma was not only a Princess but the long lost daughter of Chief Powhatan. This searcher will dismiss any and all evidence to the contrary. In a nutshell, searchers often start with an answer, and look for confirmation. Researchers start with a question and look for evidence, which after careful evaluation, can be used as proof. Be a researcher not a searcher. A searcher will read about one or two paragraphs of this blog and decide on the spot if this article is headed in the direction that will confirm their answer. If it's not looking good, off they go to the next website. A researcher will read and reread the article, make notes and look at the sources. A researcher will look up those sources and read them themselves. A super researcher will look for the original sources of my sources. A researcher will evaluate the evidence and then make their own logical conclusion. Cleopatra was an Indian woman born in what is now the Tidewater Virginia area, perhaps around the year 1600 or so. Nothing is known about her other than her English name and that Thomas Rolfe, son of Pocahontas, called her his mother's sister. Based on the relationship between Pocahontas and Cleopatra it is believed that Cleopatra was the daughter of Powhatan. If I was doing research on Cleopatra I would need to start with a question. Let's say my question was: When was Cleopatra born? Who was Cleopatra's husband? Or who was her mother? Do you have a 'research' question about Cleopatra? Start, or continue, your research with my article on Cleopatra and her family. Check out my sources and see if they are real, who knows maybe I just made them up to look impressive. Maybe I misread or misinterpreted them. Use some critical judgement. When you leave this page, go do some more research. Reach your own conclusions, not mine and not someone else's. If you find something new come back and give me a answer to your question. And don't forget to bring your sources with you. The Tidewater region of Virginia was, at the time of Cleopatra's birth, under the control of a paramount chief who was and is known by the name Chief Powhatan, but whose real name was Wanhunaconacook (this is one of several contemporary spellings of his name). Powhatan, as I'll call him, was the head of a confederation of about thirty or so Algonquian speaking tribes living in and around the Chesapeake Bay. Very little, if anything, was known about Powhatan or his people prior to the arrival of the English. The Spanish had made a brief attempt to establish a beachhead with the purpose of converting the Indians to Christianity, but the small contingent of Jesuits were quickly murdered by the local Indians. What we do know of Powhatan and his family comes from the contemporary writings of the English explorers and colonists who came to Virginia and documented what they saw and learned as they explored their new home. William Strachey was appointed secretary and recorder of the council set up by the new Governor. I don't know if it was always his intention to write a pamphlet on Virginia, but he began to make note of what he saw around him. He interviewed, extensively, two English speaking Indians, Machumps and Kemps. According to James Horn, Strachey first met Machumps in England, where he spent some time. From these two men he gathered information on the the Powhatan Indians, their lives and culture. Strachey did not stay long in Jamestown, he returned home t in 1611. Back in England he began work on a manuscript about his time in the Jamestown and all that he had learned about the people who inhabited the area. He titled the manuscript "The Histoire of Travaile in Into Virginia Britannia." Most of what we know of Powhatan and his family comes from his writings. Strachey's grammar and syntax can make his exact meaning difficult to pin down. What is clear is that Strachey did not list the names of Powhatan's children. This will be an important point in the next section of this article. Nataquoud was present at the aborted execution of John Smith. Smith wrote about him later saying he was the most manliest, comeliest and boldest spirit he has seen in a "savage". Helen Rountree also says that there was another daughter whose marriage was recorded, but whose name was not. At the age of eleven she married an important tribal leader, three days journey away. That leaves us with Cleopatra. The internet tells us a very different story about the life of Cleopatra. According to stories all over the web, Cleopatra married her uncle Opechancanough and is the mother of at least children, including, Pride Powhatan and Princess Nicketti. (see my blog on Nicketti) Very recently she, Cleopatra has been called 'Cleopatra the Shawano Powhatan', alleging some kind of Shawnee heritage. The wikitree profile for her is a really amazing mess of names. The one thing that these internet bio's cannot/will not tell us is the source of their information. No one is able to say, I know this about Cleopatra and this is how I know it. Okay, so what are we looking at here. I did take out some of the duplication but left some in for comparison. Where did all these names come from? What does 'the shawano' mean? Who was Cornstalk Windclan Powhatan and where is the documentation for him/her? There is no source or documentation offered. If you have done much searching uou have most likely seem the sentence that goes something like this: "we know the names of many of Powhatan's children from the testimony of Machumps." But here's the problem, Machumps never named the children of Powhatan. While in London, he "testified" that Powhatan killed the remnants of the Roanoke Colony. He talked to Strachey about the Powhatan people, but there is no list of names of Powhatan's children. Remember that junky genealogy folder, add bear clan, wind clan and cornstalk to it. Also, add shawano while your at it. This wikitree claims that the mother of all/most of these children was Amopotuskee, a Shawnee Indian woman from the Bear Clan in the Shenandoah Valley some 185 miles away. Other wikitrees, for the same people, have different mothers. Cleopatra has four or five profiles, each with different information. This should send up red flags for any researcher who is looking for documented evidence. My advice: although wikitree is a great site, avoid this Powhatan mess. Most of this information/misinformation seems to be based on the un-sourced Shawnee Heritage Books. All I will say about them is: if you can't provide a source for your information, then all of your content is not worth the paper it's written on. And claiming 'psychic ability' as a source of your information is more than slightly off-putting. I'm certainly not paying $45.00 for book with no sources. I have also read enough bad reviews of these books to be concerned with their content. I would urge you to tread with caution when using the books as a source for your genealogy. Use it as a starting point, but like any good genealogist, seek confirmation in original, primary sources. Oral history can be a great resource for genealogy. Treat it as a launchpad for more research, not as the gospel truth. You only have to watch one episode of The Genealogy Roadshow to see people's oral history researched and revealed as fiction. Usually there is some nugget of truth to the stories passed down by family members, but it's less shiny and bright than they had been lead to believe. The further back in time the story stretches, the more likely it is to be incorrect. That being said, here is some oral history from the Mattaponi Tribe who were once members of Chief Powhatan's federation. The Mattaponi say that the mother of Pocahontas and Mattachana was a Mattaponi Indian woman. The 'matta' in Mattachana indicates that her mother was of that tribe. Their oral history of Pocahontas goes on to tell us that after she was kidnapped by the English, her Indian husband, Kocoum was murdered. During her captivity Pocahontas was brutally raped, possibly by Sir Thomas Dale. She gave birth to the child and later married John Rolfe who claimed the son as his own. Now, how many people who say they are descended from Thomas Rolfe have changed their family tree once they read that oral history? In the above wikitree some of the Indians have been given a surname. I understand that wikitree makes you supply a name but why this mishmash: Nicketti Mangopeesoman Opechan Powhatan. In 1622, just prior to their attack on Jamestown, Opechancangough and his brother Opitchapam changed their names. Opechancangough became Mangopeesomon. This was his personal name, changed for his own personal and spiritual reasons. I see no reason why it should be applied to anyone else. In 1561 a Spanish Caraval was blown off course and dropped anchor in a wide river in the Chesapeake Bay. They sailors did some exploring and make repairs to the ship. The encountered at least two Indian males who for some reason opted to go to Spain with them. The fate of only one of the Indians is recorded. Paquiquineo, described as a young Indian, was renamed Don Luis de Velasco by the Spanish. He traveled to Madrid and met with King Philip II, and spent some time in the New World, visiting Mexico City. After nine years away from home, he longed to return to his homeland. To make a long story short, Don Luis convinced a group of Jesuit Priests to return with him to Virginia and set up a mission to convert the Indians to Christianity. Shortly after they arrived they began to build an outpost on the Pamunkey River near a village whose people were subjects to Don Luis' family. However, upon his return, Don Luis reverted to his Indian heritage, cast off his Christianity and slaughtered all the Jesuit Priests, dramatically ending any hope the Spanish had for adding Virginia to their list of conquests. From a historical perspective, the two men might or might not be the same person. Where does this leave us from a genealogical standpoint? If there is no historical proof, then there is no genealogical proof. There is only speculation. Without proof you have nothing. Hokolesqua is said, according to the above wikitree, and many other web generated family trees, to be the husband of Pasmere Powhatan. 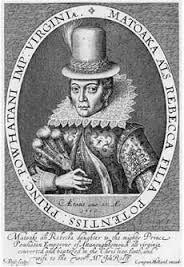 Pasmere was the daughter of Pride Powhatan and an Englishman named 'Thomas Pasmere Carpenter'. Thomas is the central figure in another myth connected to Cleopatra. According to the legend, Thomas Pasmere Carpenter married Pride Powhatan, daughter of Cleopatra and Opechancanough. Their children are said to be Shawnee, but their grandchildren somehow become Cherokee. This myth has been thoroughly investigated and found to be totally false. Our single source for Cleopatra is a derivative record, meaning it was copied from an original, and in this case it seems to be a copy of a copy. Because we cannot compare this derivative to the original we have no idea if any mistakes were made. The information is primary, it was likely written at the time of the council meeting. The evidence when applied to questions concerning Cleopatra gives us a direct answer to only one question, was Cleopatra the sister of Pocahontas. We are left with any number of unanswered genealogical questions, when was she born, who was her mother, was her father Powhatan, who did she marry, did she have any children? None of these questions can be answered by this tiny scrap of information. How then has she come to be in so many family trees? Good question, I blame the 'copy and pasters' on the internet. At the beginning of my article I asked "are you a searcher or a researcher"? If you a serious searcher or researcher, copy my citation list and dive into the hunt. Let me know if you have anything I don't or if you find any new 'evidence'. If you are a 'copy and paster' or you already know the answer to your Cleopatra questions, I'm glad ya'll made it all the way to the end of this article and hope you have a nice day! Francis Mossiker, Pocahontas: The Life and the Legend, (New York: DeCapo Press, 1995). James Horn, A land as God Made It, Jamestown and the Birth of America, (New York: Basic Books, 2005), 9. Helen C. Rountree, Pocahontas, Powhatan, Opechancanough, Three Indian Lives Changed by Jamestown, (Charlottesville: University of Virginia Press, 2005). Frank E. Grizzard and D. Boyd Smith, Jamestown Colony: A Political, Social and Cultural History, (ABC-CLIO, 2007). (http://www.encyclopediavirginia.org/strachey_william_1572-1621 : accessed 20 October 2015). William Strachey and Richard Henry Major, The Historie of Travaile Into Virginia Britania: Expressing the Cosmographie and Comodities of the Countrie, Togethir with the Manners and Customes of the People, (London, 1894); digital images, Google Books (http://www.play.google.com : accessed 20 October 2015). Helen C. Rountree, "Marriage in Early Virginia Indian Society," article, Encyclopedia Virginia, Virginia Foundation for the Humanities, 30 May. 2014. Web. 23 October 2015. Rountree, Pocahontas, Powhatan, Opechancanough, 35. Thomas Wentworth Higgins, A Book of American Explorers, (Boston: Lee and Shepard, 1877) 258. Phoebe Mills Farris, "Pocahontas' First Marriage: The Powhatan Side of the Story," article, American Indian, (http://www.americanindianmagazine.org/story/pocahontas-first-marriage?page=show : Spring 2014 issue; accessed 1 November 2015). Horn, A Land as God Made It, 15-16. Brendan Wolf, "Don Luis de Velasco/Paquiquineo (fl. 1561-1571)," article, Virginia Foundation for the Humanities, Encyclopedia Virginia, (http://www.encyclopediavirginia.org/don_lua#start_entry : accessed 31 October 2015). "Hokolesqua," Ohio History Central, article, Ohio History Connection, (http://www.ohiohistorycentral,org : accessed 3 November 2015). Thomas Passmore patent, 14 August 1624, Land Office Patents [Book] 1, 1623-1643: 10; Colonial Land Office Patents, 1623-1774; Virginia State Archives; digital images, "Virginia Land Office Patents and Grants," Library of Virginia (http://www.lva.lib.va.us : accessed 7 November 2015). William Hand Brown, Clayton Coleman Hall, Bernard Christian Steiner, "Archives of Maryland, Vol 4," (Baltimore: Maryland Historical Society, 1877). xxxx Reynolds, [e-mail for private use] to Jeanie Roberts, e-mail, 6 November 2015, "False Indian Genealogy," local folders, Powhatan Indians, privately held by Jeanie Roberts [e-mail and address for private use] Texas, 2015. 1. As for myself the belief in Opechancanough as my 8th grandfather fits because while stationed in England in the 50’s I had a strange urge to kill English women and children.This of course bothered me greatly so much so that I would not even tell my shrink.Finding out about Opechancanough had let me realize that it was bred into me and I am not really a potential mass murderer.For this reason I embrace Opechancanough as mine and honor his name for being probably the first native American to fight for Indian rights.I even call my new grandson "Opi" even though my son named him (xxxxx). 2. Chief Opechancanough had brought back a woman from his attack on Jamestown in 1622. Her name was Mary Sizemore. They had a child named Goldenhawk Sizemore. Goldenhawk left the Powhatan's to live in the "white" world. As he was traveling south, he met a woman named Agnes "Aggie" Cornett Shephard, who was supposedly half Cherokee. Many of the Sizemore's are decended from this union as one of Goldenhawk's descendants was George All Sizemore, who had some 50+ children. Want to leave a comment? Please be thoughtful, leave your sources if you are making a claim. Can you tell me the specific name of the online course you took on geneaological proof that you recommend because you didn't state the name of the course above. Thank you. Thank you for this. I have the same frustrations with lineages that keep appearing and multiplying on the internet. We formed a genealogy research group several years ago (nikitie@yahoogroups.com.) Many of the Indian people you mention here are the ancestors who we are researching. Several of our members descend from ancestors who we believe to be orphans left behind when Chief Cornstalk (and his son) was murdered in 1777. I believe I descend from an Indian woman named Nikitie who married Gabriel Arthur, half breed son of Gabriel Arthur the scout. Researching these ancestors in the early 1800's and 1700's is very tricky business; it's like chasing shadows. The downside of so much internet research is there's no accountability. And all these complex Indian genealogies that aren't substantiated discredit those of us who are serious researchers. So, again, thank you. Jo, Thank you reading and commenting. I have not heard of Gabriel Arthur. I will have to look him up. In the last paragraph - which I believe you found on a message board - This is a commonly referenced story...but this version has the names of the two Sizemore men backwards. George All Sizemore married Aggie Shepherd and had a son, Goldenhawk Sizemore who then fathered over 50 children (court recorded testimony is validation of # of children). Your blogs are very informative. I enjoy reading them. Thank you for all your hard and dedicated work.